This chair will turn your head! The aye chair in its swivel version picks up on the “Y” design shape in the spread of its four wooden legs and therefore fits perfectly with the yps table and bench ensemble. Thanks to the special swivel and shock-absorbing mechanics, aye gently rebounds when you sit down and automatically returns to its original position when you stand up. The seat shell cups your body like a hand, and the feel of an upholstered chair ensures many pleasant hours at the table. Your comfort is also ensured by the flexible backrest, ergonomic armrests and the comfortable, buoyant seat. 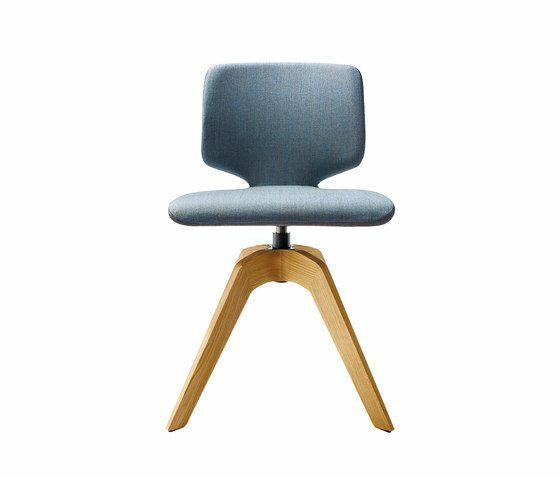 The chair is available in a solid colour in either leather or textile upholstery, or in two different colours, using all leather, all upholstery, or one of each. With 20 shades of leather and over 50 colours of upholstery to choose from, be sure to set aside enough time for the selection!